As a veterinary technician, your work is hands on. You enjoy using your technical and educational skills to assist the veterinarians in the practice. There is never a dull moment: drawing blood, placing catheters, assisting in surgery, prescribing medication…and more! It’s safe to say that you love your job! What if you could no longer do your job? Have you ever thought what would happen if you became sick, ill, injured, and disabled? How would you pay your bills if you could not work? Disability quickly affects your future plans and the lifestyle you worked so hard for. In this article, we discuss disability insurance and the best disability insurance for veterinary technicians and veterinary assistants. The practice and the clients (the pets and animals) are very important. There is also a group of people who are more important. Who can be more important than the practice, and even the good customers who bring their pets to us, you think. They pay my income. True. They do, but they don’t love you as your family loves you. By far, if you have a family, your spouse and children rely on you more than you think. They love you more than anything. There are tough questions that need answering. Would you and your family be able to continue your standard of living without your income? If not, what is “plan B”? Would your spouse have to work or work more? Would you need to sell your home to make ends meet? Who could be flexible with the children? Would you have the money to hire someone to take care of the kids? The tough questions can go on and on. Disability is known as the destroyer of dreams. Your future and family dreams could be destroyed. They don’t have to, though. With disability insurance, you have peace of mind knowing that you have a plan – and income – in place should the unexpected happen. You think it won’t. However, the probability of having a long-term disability is anywhere between 1 in 3 and 1 in 4 workers. Contrast this to unexpected death, say from a motor vehicle accident, which is 1 in 114. Even dying from cancer has better odds: 1 in 7. But, John, I’m not going to get hurt or be in a wheelchair, you say. Wow! I respond. If you know that, then you should not be a veterinary technician or a veterinary assistant. You need to play the lottery! You won’t have to worry about income at all! Jokes aside. In all seriousness, when we think of disability, we think of someone bound in a wheelchair, right? Not true and far from it. According to the Council For Disability Awareness, 90% of disabilities are from illnesses (like cancer) than from accidents. That means an illness or condition, such as cancer or a heart condition, has a higher probability of disabling you than a skiing accident. Ok, John, but I have workers compensation. I don’t need to worry about money. That’s great, I say. Did you know that 5% of disabling conditions are work-related, leaving the other 95% not covered by workers compensation? That makes sense, since 90% of disabilities are from illnesses. Again, what is your income plan if you can’t work? Hopefully, we have made a great case showing that veterinary technicians and veterinary assistants need disability insurance. Do you have some through work? While that is good, most likely it is not enough. Why? Generally speaking, you pay for your group (i.e., work) disability insurance through pre-tax deductions from your paycheck. While that seems good, as it lowers your income for income tax purposes, it is not good if you need to take a benefit. The benefit ends up being taxable income. What does this mean? By every April 15th each year, you need to report your disability benefit and pay taxes on it, which can put additional strain on your finances. This makes, in effect, your net-disability pay being about 30-40% of your gross salary. Can you and your family live off that? The good news is that incrementally, you may not need much more. How much you need depends on your income and needs. Most importantly, you will have peace of mind. In the case of your disability, you will receive a benefit that helps maintain your standard of living, cover costs such as your mortgage, utilities, and groceries, and keep your family dreams and future alive. While every carrier is different, here are the important policy basics for veterinary technicians. You generally can cover up to 70% of your gross salary. Every carrier is different, though. Some have 60% coverage maximums. For example, if you have a gross monthly salary of $5,000, you can cover up to $3,500 (70%). Obviously, your health matters for underwriting. What you may not know is that your occupation matters, too. Most carriers will not cover high-risk professions for the simple reason of an increased probability of disability. Carriers classify the risk from a scale of 1 to 5 or B to 5A. The lower the number or letter, the riskier the occupation, and the higher the premium, all things being equal. Veterinary technicians and veterinary assistants are typically classified as a 3 or 3A. Sometimes, classification upgrades. Contact us for more information about upgrades. There is an elimination period, which is like a deductible. It is the length of time – a waiting period – that elapses before disability benefits begin. For example, a 90 day elimination period means your benefit period will begin after 90 days of disability. This means you need to have adequate savings to carry you and your family until benefits begin. The maximum benefit period is to age 67 coverage. This means your disability benefits will continue to age 67 provided you continue to meet the proper definition of disability. (More on that below). The definition of disability matters. You generally want “true own occupation” coverage followed by a form of modified own occupation. What is “true own occupation”? 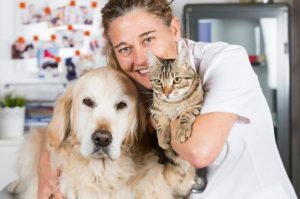 Simply, it means you can continue to work in another occupation while receiving disability benefits for your own occupation as a veterinary technician. So, if you can’t use your hands, but you can greet people at Walmart, you will receive disability benefits in addition to your earnings as a Walmart greeter. Modified own occupation is a bit different. You will receive a disability benefit based on your education and duties as a veterinary technician. However, you can’t work in another job. So, if you worked as a Walmart greeter, you won’t receive disability benefits under the modified own occupation definition. Finally, there is the stringent “any occupation” definition. This means, simply, if you can work in any gainful occupation (for which you are reasonably suited, considering your education, training, and experience), you’ll be denied benefits. So, under this definition, you won’t receive a disability benefit based on your education and experience as a veterinary technician because the insurance carrier says you can work as a Walmart greeter. The plans we work with contain the favorable true own occupation definition for veterinary technicians. Moreover, you can align this definition to match some or all of your benefit period. Disability benefits from individual plans are income tax-free. As we mentioned, the benefits from group disability insurance plans are typically taxable. There are various additional benefits available including, but not limited to, partial disability, recurrent disability, and a survivor benefit if you were to die from your disability within a specified timeframe. Return of Premium Rider: Provides disability insurance coverage if you need it, your premium money back if you don’t. Retroactive Injury Benefit Rider: Pays benefits from the date of disability due to injury if disability occurs within 30 days of the injury and continues through the elimination period. Activities of Daily Living Rider: This rider pays an additional benefit if you can’t perform two or more of the activities of daily living or cognitive impairment. This condition is a catastrophic disability. In other words, this rider will pay an additional benefit if you need help or assistance with your first 20 minutes of your day – dressing, toileting, eating, transferring (i.e. walking), etc. Think of it that way. Residual Disability Rider: This rider will pay a benefit if you return to work in your occupation, and you experience an income loss of 20% or more compared to your pre-disability income. Usually, the amount of disability income you receive is a percentage of your total monthly disability benefit. For example, let’s say you return to work and experience a 40% income loss. If your monthly disability benefit is $4,000, you will receive $1,600 ($4,000 X 40%). Why would you need this rider? Most disability insurance policies allow partial disability benefits upon total disability first. This means if you are only partially disabled (i.e. you can still work but not full-time), you will not receive any benefits until you have met the carrier’s requirements for total disability first. But, you are partially disabled, not totally disabled. Without this rider, you won’t receive any partial disability benefits until you have met the total disability requirements first. Ugh! Typically, this rider circumvents the total disability requirement and allow you to receive benefits immediately (after you satisfy the elimination period). Here is a very easy example. You lose feeling in your wrists and fingers. The doctor says you need to rest and limits your work to 2 days per week. Without this rider – or a plan that has a partial benefit without a total disability requirement first – you would not receive any disability benefits because you are still working. You are probably wondering who we like to work with. First, we work with many disability insurance carriers. So, we are sure we can find one that meets your needs and budget. Second, the “best” is only the best one that fits your needs, situation, and budget. We don’t try to fit a square peg in a round hole with such an important insurance coverage. However, there is one carrier that stands out to us. That carrier is Illinois Mutual. An A- rated carrier, Illinois Mutual operates in the middle-income market. More specifically, it offers a niche product designed for professions like veterinary technicians and veterinary assistants. They offer a variety of options that customize to your specific situation. Moreover, the premiums are generally very competitive. They even offer simplified underwriting (i.e., no medical exam) in many cases. And, what about premiums, you ask? Depending on your age, health, income, and riders, the premiums could run anywhere from $0.50/day to $3.00/day. Think that is expensive? I bet you buy coffee almost everyday or your lunch. What is more important? Insuring your income or buying a cup of coffee? There are many ways to afford disability insurance. We hope now you have a solid idea why veterinary technicians and veterinary assistants need disability insurance. Confused? Don’t feel that way. We’re here to help educate you and protect your income and future. Don’t know where to start? Use this disability insurance needs analysis worksheet. Follow the instructions; it is rather easy to fill out (we at My Family Life Insurance try to make understanding insurance easy). Next, feel free to reach out to us for our assistance or a quote. Or, use the form below. We only work for you, your family, and your best interests only. We have helped many veterinary technicians secure the right disability insurance for their specific situation, giving them and their families peace of mind.